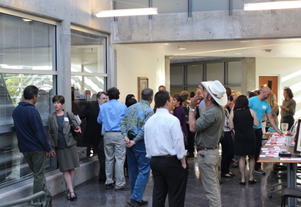 About 50 people attended the 25th anniversary celebration of the Wild Friends Program at the UNM Law School on May 19. 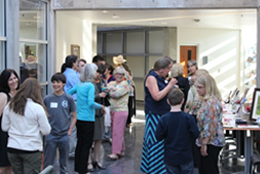 UNM Law School’s Wild Friends Program celebrated twenty-five years of providing civics and wildlife education to students across New Mexico on May 19, 2016. 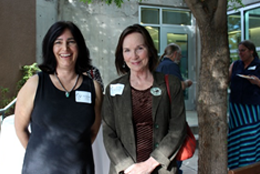 New Mexico State Senator Mimi Stewart and former Senator Dede Feldman, as well as numerous teachers, conservation organizations, law students, volunteers, and other Wild Friends supporters attended the celebration. Dean Sergio Pareja welcomed guests in the Hart Wing patio at the law school and congratulated the program on its success. Wild Friends Director Sue George discussed the program’s work of teaching students to help draft legislation on wildlife conservation issues and working to pass it in the New Mexico State Legislature. Ruth Musgrave and Carolyn Byers, who co-founded the program, shared stories of the early years. Middle school students Daniel and Sonora talked about their experiences in Wild Friends and the value of the program. The fundraiser included a silent auction, which brought in over $1000 for Wild Friends. Congratulations, Wild Friends, on 25 years of 'wild' civics education! 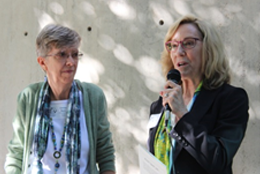 Ruth Musgrave (right) and Carolyn Byers, who founded Wild Friends, shared stories of the program's early years. Wild Friends Director Sue George (left) with New Mexico State Senator Mimi Stewart. 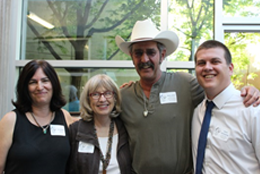 Sue George with former New Mexico State Senator Dede Feldman, teacher Nick LaRue and former law student Jonas Armstrong.